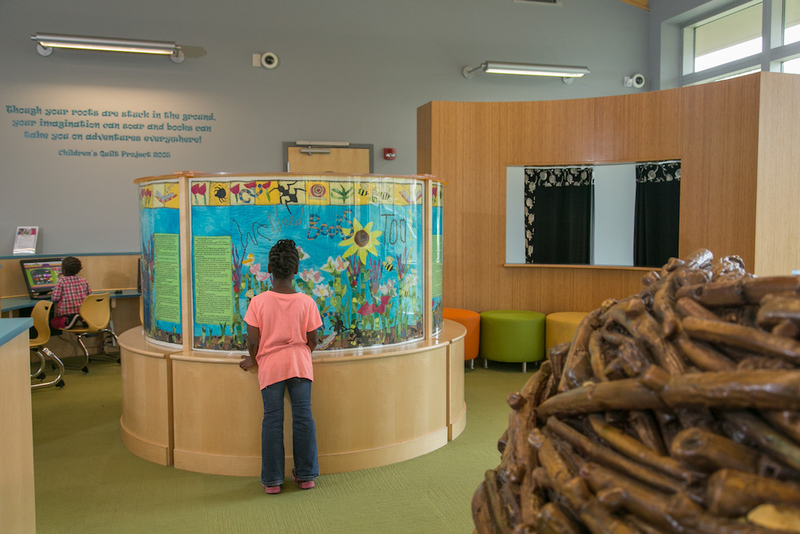 The McGirt Horton Branch Library has a large amount of Greensboro public art. Everything in this section is somewhere in the McGirt Horton Branch Library. Find some new books and enjoy exploring the art! From September 12 through November 8, 2005, more than 40 children of the McGirt-Horton community participated in original story writing and the creation of a story quilt. Project by by Peg Gignoux and Susie Wilde. Photos taken by Bert Vanderveen and Action Greensboro. A painting by Ernest Watson depicting people and events from the McGirt Horton Community. Photos taken by Bert Vanderveen. A painting on found boards. Photos taken by Bert Vanderveen and Action Greensboro. Angela Zappala earned her degree in studio art from Hunter College in NYC. She continued her studies in portraiture privately at the New York Art Student’s League and pursued sculpture and drawing at the Florence Academy of Art in Italy. Photos taken by Bert Vanderveen. Giant books make benches for reading and conversation. Photos taken by Bert Vanderveen. The Children’s Garden Sculptures are a series of books and book-related sculptures all with differnet relief carvings and additions discussing different types of literature. Photos taken by Bert Vanderveen.